Financial Planning Tip #4 is to settle your basic Financial Planning needs before even talking about specialist financial services like taxation advice and investment management. What Are Your Basic Financial Planning Needs? So how can you refer to the simple house model above? Before you can have your luxurious interior design, furniture and such, you have to set up the foundation, the whole structure of the house, the fixtures and fittings first. These are of the highest importance to ensure the stability of the house. The initial cost for setting up these are high and you have to set aside huge amount of commitment before you get to enjoy the rest of the house later. Therefore the same principle applies to Life Protection and Health Insurance. These two areas are of the highest importance. You can have the highest paid job or the most rewarding business but you have to be physically alive and healthy in order to enjoy all the benefits (moving up the scale to retirement, savings, dreams & ambitions and achievements). while you slowly nurse yourself back to good health and without affecting your lifelong savings and dreams. Many people just think that they need to work hard in their current job, put all their savings into a local bank with savings interest rate of 0.25% per year. With current inflation averaging around 5%, your bank interest rate is not able to catch up with the increase in prices. This means you are actually short-changed and you have to find other resources to make up for a comfortable retirement or to really an expensive dreams! That is why you need to do some planning for your retirement and putting some commitment into a regular savings or investment plan. 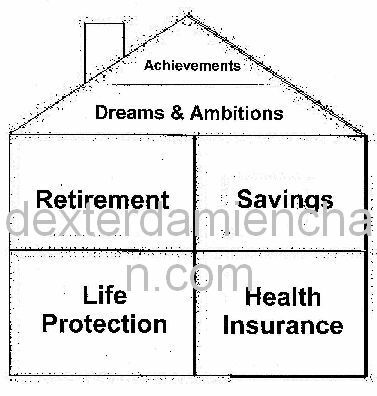 If you can do only one area, the priority will be by doing regular savings into a plan that generate a higher interest rate – you are making your money work harder for you and you get to combat against inflation – you get to achieve your dreams easier and you get to have more to set aside for your retirement. When your lifelong savings are intact, and your savings plan are in place, you will get to see that you have enough money that you can use for retirement – a period that you are not working at all! You can therefore ensure that you can still continue to live your current lifestyle during your retirement period, the plus point is that you do not need to work anymore! Therefore do you see the importance of having a good savings plan that will help to supplement your retirement planning? Linking these two areas to the House Model, if you have done it well, you have done up your foundations, which will enable you to be able to create a roof over it and your dream house is nicely done up! Imagine all the luxurious interior design and facilities you can put in there! Your Basic Financial Planning is like Building A House. You have to settle and ensure you have enough planning for your Life Protection and Health Insurance – this is to take care of the impacts should your health turns to the worse. After you have done so, you have to start planning for your retirement with a good regular savings plan in place. This will help to take care of the effects of inflations, make your money work harder and definitely help you to achieve your dreams faster! Great post, especially the illustration of financial planning is like building a house!